The first issue caused programs that use Microsoft MPEG-2 handling libraries to crash (e.g. Windows DVD Player). The second issue listed by Microsoft affected customers with Switch Embedded Teaming (SET) enabled who “might experience a deadlock” according to Microsoft. KB4013429 refers to the previous cumulative update of Windows 10’s Anniversary Update version. Woody notes over on InfoWorld that Microsoft has yet to patch an Internet Explorer bug that breaks Dynamics CRM. Günter Born notes on the other hand that the cumulative update does not fix the system restore no longer working issue that some users experience after installing January’s KB3213986 update. 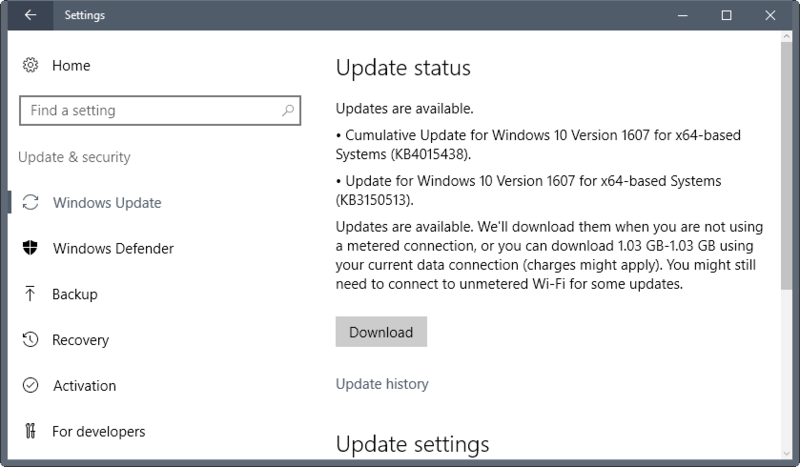 KB4015438 is already available through Windows Update. You can run a manual check for the update by going to Start > Settings > Update & Security > Windows Update. If you prefer to download the update manually, point your web browser to Microsoft’s Update Catalog. There you find the cumulative update listed for Windows 10 and Windows Server 2016. The 64-bit versions of the update have a size of about 1 Gigabyte, the 32-bit version about 560 Megabyte. This entry was posted on Thursday, March 23rd, 2017 at 10:36 am	and is filed under General News. You can follow any responses to this entry through the RSS 2.0 feed. Both comments and pings are currently closed.